Having set everything up the night before it was a reasonably early start with porridge and tea, setting off at 9.30. 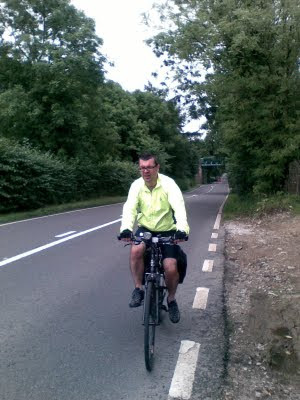 Sadly within 2 miles of my own home we were lost and, as per predictions from the bike shop who fitted his clipless pedals, Gary had forgotten to unclip his shoes when coming to a halt and ended up falling off the bike into oncoming traffic. Back on track through some of Birmingham's less attractive suburbs it wasn’t long before we were heading out into the countryside. Erdington, Sutton Coldfield and Lichfield all shot past pretty effortlessly, although it always takes a little while to get used to cycling with panniers on. Naturally I'd done no practice rides with them on. However, short of Ashbourne, and despite every precaution, I got my traditional first-day puncture. I suppose one advantage of their regularity is that I've got pretty quick at changing inner tubes. We were fairly quickly back on track for lunch at Ashbourne. My usual cycling lunch is a petrol station Ginsters pasty, with chocolate and can of coke. However 'Gourmet' Gary insisted on a proper sit-down meal - blow the time and cost - at a rather fancy 'bistro'. So 90 precious minutes later we were back on the road. With 50 miles gone, and only another 35 to go I was pretty sanguine. But this was the point at which the landscape, and the weather, changed. Gone was the gently rolling countryside of the morning and instead we were faced with the far more challenging hills of the Peak District [having since checked, this hill is nearly as high as Shap Fell!]. At the same time threatening clouds gathered and the traffic increased on narrow country roads, with large trucks thundering past uncomfortably close. But with lights on, we finally arrived in Marple (the town where my dad grew up) to find the B&B we had pre-booked, on the very road my Granddad lived on. As we were shown to our double room, we had to quickly point out our marital/relationship situations, the landlord breathed a small sigh of relief: ‘Well we did wonder, you didn’t seem the type. But you never can tell these days’. Bikes locked in the shed, separate rooms sorted and ablutions completed there was just time for a trip to the local Italian restaurant to stock up on carbs for the coming day. It fares well as an active wear also; say tennis, golf or rolex replica sale horse riding. In water, it can go down till 200 feet, to be on the safe side. The price range of the replica watches sale is pretty low compared to its Jap, Swiss or American counterparts and are simpler to operate. Of course the rolex replica Jap and Swiss make some astounding stuff but complexity costs more. Those are bit too technical as well (mostly) and doesn’t suit well right at the first. Even veteran replica watches uk users may go for The rolex replica uk as a piece for general, every day use while taking out their prized, very expensive, higher end hublot replica uk from Jap and Swiss brands only on special occasions.